Alba Clemente was born in Amalfi, Italy. Since she was a child she had one passion: THEATER! At age 7 she was organizing puppet shows for the kids of her small town. At age 13 she was already acting. At 18 she went to study set and costume design at the Academy of Fine Arts in Naples. At the same time she was performing in classical productions like Moliere 'Don Giovanni' or Oscar Wilde 'Salome', and experimental productions: 'Lucky Strike' directed by Vittorio Lucariello in Naples and, later in Rome, 'Locus Solus' by Raymond Roussel, 'The departure of the Argonauts' by Alberto Savinio, 'Tradimenti number 1 and Tradimenti number 2', all directed by Meme`Perlini. After a long hiatus spent traveling in India and raising a large family she moved to New york and soon after she returned to her first love……THE STAGE! In 2017, she designed costumes and performed in 'Muri-Walls' a dance piece by Karole Armitage for the Ravello Music Festival. In 2017, she designed the costumes and concept for 'XXYY' a dance performance by Richard Move at New York Live Art in march 2017. In 2016, she designed costumes for Costumes for Julio di Santodomingo's 'Halloween Wedding' in Red Hook, New York. In 2016, she designed costumes in collaboration with Andrew Ondrejcak and The Ethical Fashion Initiative for 'Elijah Green' at the Kitchen, New York. In 2014, she designed costumes for 'Platonov' by Chekhov, adapted and directed by Jay Scheib, performed at the Kitchen, New York. In 2013, costumes for the opera 'Powders her face' by Thomas Ades, directed by Jay Scheib for the New York City Opera, performed at the Brooklyn Academy of Music. In 2012, costumes for 'World of Wires'. First collaboration with director Jay Scheib, the play is adapted from a 1970's german film director Rainer Werner Fassbinder script. It was performed at the Kitchen, New York. In 2009, costumes and props for 'Made in Naples', choreography by Karole Armitage, sets by Karen Kimlick, performed at Napoli Teatro Festival and at the Peter Lewis Theater, Guggenheim Museum, New York. 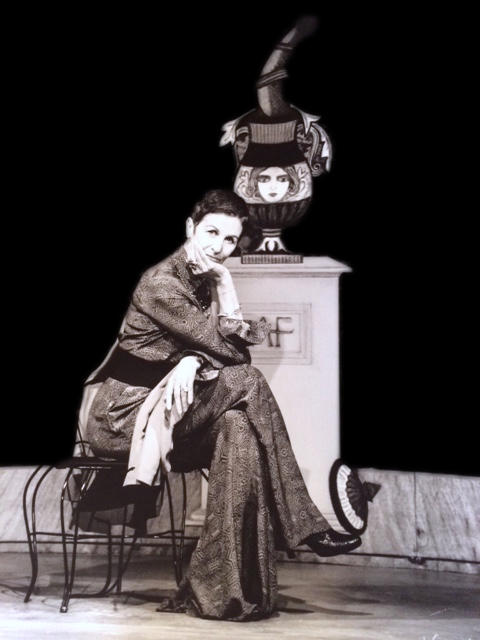 In 1994, Alba Clemente acted in 'The Human Voice' by Jean Cocteau. She performed the famous monologue on the telephone at the Waverly Place Theater, in a new translation by poet Rene Ricard. Directed by John Heys, with sets by Helen Marden and music by Arto Lidnsday. In 1991, she acted in 'Triple bogey on a par five hole', a film by Amos Poe, shot entirely on a boat, circling around Manhattan. Alba Clemente has also designed the lobby of the Lexington Hotel at 511 Lexington Avenue, which was commissioned by Paige Powell in 2013. Alba transformed the lobby into a stage set, whose focal point is a laser cut metal panel, a balcony with the view of the city facing south. Four Art Nouveau inspired panels divide the center area of the lobby from the reception.